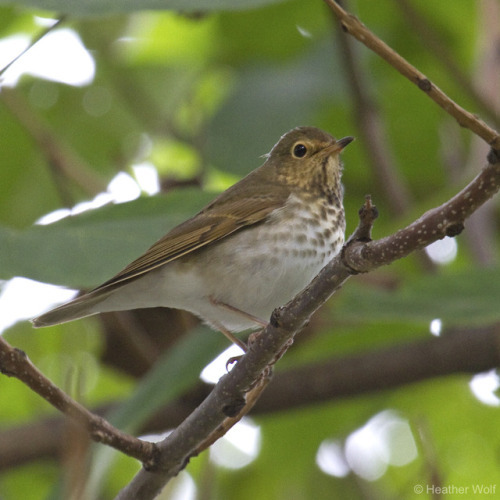 My friend Eric told me he’d seen Swainson’s Thrush in Carpinteria Creek near Lillingston Canyon Road, so today I did the crack-of-dawn thing, dropping into the creekbed and walking along it for a mile and a half. I saw lots of great birds, including three Swainson’s Thrushes, the last of which posed politely and turned several times so I could appreciate it from all angles. I also saw a couple of Purple Martins flying by with a flock of swallows, which was neat even though I’d already seen them this year, and something truly adorable: A female Anna’s Hummingbird bathing in the creek by hovering and lowering herself slowly into the water while paddling upstream with her tiny feet. Tags: carp without cars, birds, santa barbara county year list, swth. This entry was posted on Tuesday, May 1st, 2018 at 11:11 am	and is filed under Tumblr reblogs. You can follow any responses to this entry through the RSS 2.0 feed. You can leave a response, or trackback from your own site.